Cycle route 2 starts from the CG-2 in the village of Canillo (1,523m) and finishes on the CS-340 (1,980m) at Coll d’Ordino. Its category is 2a (accessible). 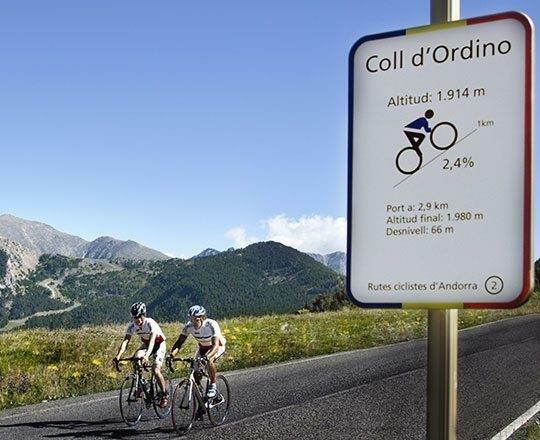 Andorra Cycle Route 2 starts in Canillo, on the roundabout that leads to the Coll d’Ordino along the road to Montaup. At this point there is a gradient of 6.8%, which ends up as 6.1%. Therefore the average gradient up and down is 5.1% with a total difference in level of 457 metres and a distance of 8.9 kilometres. The curiosities along the route include the fact that the climb to the Casamanya begins at the end of the Pass (2,740 metres), which is in the centre of the country and one of the most visited places in Andorra.